Fall is on its way – you know how I can tell? Something (or, more likely, everything, has apparently gone to seed. I woke up Sunday morning with a stuffy head, and I’ve been either sneezing or blowing my nose ever since. It’s pretty unpleasant, to be honest. 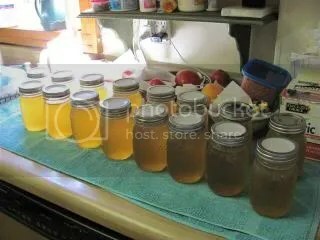 However, we did get a batch of chicken stock made last week, so at least we’ll have plenty of chicken soup to help ward off actual colds this winter . . . Remember last week, when I mentioned that peaches this year have been so consistently delicious? Yeah, well, I may have gone a little overboard. I don’t know, you tell me – when there is ONE person in the house who actually eats peaches, is season total of HALF a BUSHEL going overboard? I did make a peach pie for our family’s Labor Day picnic, so that helped. I’ve also got filling for three more pies in the freezer, and, honestly, I couldn’t see ever needing more than three pies’ worth of filling in the freezer. 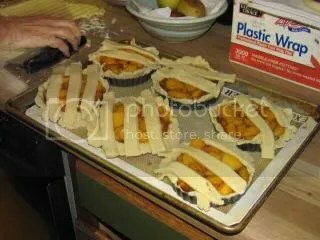 So I decided to try my hand at making tarts. And hey! It worked! Though I could have done without the top crust – now I know. You know that butternut squash plant that sprung up in my garden? The one that’s trying to take over the world? Yeah, well, I finally grabbed a machete and hacked my way to the other side of the deck (not really, but I may as well have), and what did I find? 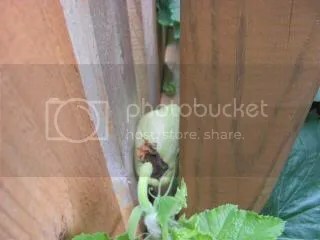 A baby squash had grown between the fence and the fencepost. That’s right, it the SQUASH had SQUISHED its way in there. 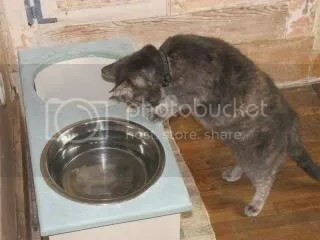 How am gonna get that thing outta there? No more freebie plants in the garden, and that’s that. Sheesh. 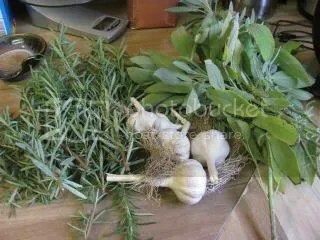 As we do just about every year, I went out to the garden and picked a bouquet of rosemary and a bouquet of sage to be chopped and combined for Tuscan Herbs – gosh we love this stuff! Plus, for the first time this year, we’re using our OWN garlic! That’s right, we grew everything in this herb blend in our own garden. Except the salt, of course. Lake Ontario is fresh water – all the Great Lakes are. 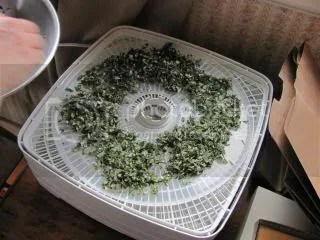 This year, though, we thought we ‘d try something a little different – instead of sticking the tray of drying herbs on top of the fridge, we decided to try the food dehydrator. After all, herbs are food. The dog’s out on his walk, and who gets mighty bold? I’ll be honest – I saw Minerva Kitty sniffing around Jarly’s feeder, and when she saw me seeing her, she ran off. So I set this photo up – I planted a hunk of chicken for her, then I called her, and she CAME! So I had to give her half the original hunk of chicken, and show her where the rest of it was. But dudes – she was nosing around the dog’s feeding area AND she came right to me when I called her! And once again, it’s time for the weekly menu plan. 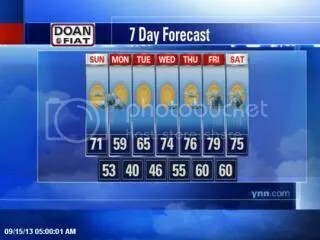 While we’ve got some nice-ish days ahead, it’s definitely getting cooler. And damper. But while it’s great weather for walking the dog (he HATES walking when it’s too hot – who can blame him? ), we can’t necessarily count on grilling every evening anymore, can we? Monday – We had better than half a roasted chicken in the fridge from last night – some of that got dumped into a quick chicken soup over the weekend, and the rest has been chopped and is residing in some mole sauce from the freezer. Along with that, we’ll enjoy some Mexican rice and a green vegetable – green beans, probably. Tuesday – Since Tuesday is looking to be such a nice evening, we wanted to grill, and Peeps suggested salmon. Not just plain salmon, mind you, but salmon with a reduced apple cider glaze, which I thought sounded fantastic! I’ll do some pan-roasted broccoli, and we’ll have some grain – barley? rice? I don’t know, but something. Wednesday – Since we bought a mess of boneless short ribs on sale, Peeps has been positively itching to use some for burgers. He’s also going to whip up a batch of homemade burger buns. Some potatoes on the grill and a tossed salad – how better to squeeze out every drop of summer that we can? Thursday – Let’s hear it for Minimal Effort Thursday (that’s a Thing now)! This weekend, we made Beans with Kale and Portuguese Sausage – only we used a package of “smoked sausage” and our own kale from the freezer. And the coolest part is that all we have to do now is reheat it! 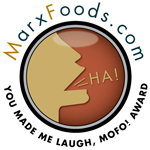 Well, that, and come up with some delightfully crusty bread. . . .
Friday – Can I squeeze one more pizza night out of my fresh tomatoes? I think so. I hope so! It’s too early to say goodbye to fresh tomatoes! Mmm…mole…I haven’t made that in a while. It’s perfect fall food. Peaches down south have been consistently wonderful as well. We’ve plowed our way through 2 & 1/2 bushels this summer. About half were canned and the other half eaten. Seriously, the three of us were eating 4 or 5 peaches a day; every time we walked by the box of peaches, we picked one up to eat. Your menu, as always, looks great! Thanks! I’m down to one lone peach left – this weekend, the pears will probably start, though, so I won’t be fruitless. 🙂 And, of course apples. . . but I do love peaches! My mother’s garlic didn’t come up last year, either – I have no idea why. 😕 Are you, by any chance, using supermarket garlic? I wonder if it’s been treated with something to keep it from sprouting? Our potato guy treats his potatoes to keep them from sprouting. Well, now the week is basically over and I did not reply when I meant to every day. Loved the looks of the tarts and your volunteer squish. My neighbor upstairs has morning glory plants in pots and some of the seeds drifted down to the area in front of my porch. With all the rain we had I now have morning glories coming up everywhere and those runners really run. I have tried to loop them away towards the middle of the area and now they are blooming! I just CAN’T pull them up when they are blooming can I? I am not giving up on you until there is a picture of Jar and Kitty are sleeping together in the same place with no blood flowing. I know you can do it. Have a super weekend. Morning glories are so pretty! I’m thinking of putting some in along the outside of the fence in the back yard. IF the irises don’t flourish (which they probably won’t – I don’t think there’s enough sun there).